The FTT UL 94 tests for flammability of plastic materials giving a preliminary indication of their suitability for a particular application. The apparatus is supplied as a complete system incorporating all the features necessary for ease of use and safety. 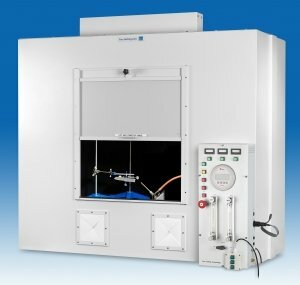 It conforms to all five UL 94 horizontal and vertical Bunsen burner tests and to the associated US and international standards and to UL 1694 (for small plastic parts). Horizontal Burning Test: UL 94HB (ASTM D 635, IEC 60695-11-10, IEC 60707, ISO 1210). Horizontal Burning Foamed Material Test: HF-1, HF-2 or HBF (ASTM D 4986, ISO 9772). A bench mounted draft free combustion chamber having an inside volume of 0.85m3 and fitted with an interior light and an exhaust fan to enable the easy evacuation of combustion products. A burner, in compliance with Practice ASTM D 5025, with simple angle adjustment (0E, 20E, 45E) and precise gas control system including gas flow meter, pressure regulator and pressure gauge. Two access ports enabling entry to the chamber for movement of the burner and specimen. Three digital test duration timers for accurate but simplified operation.